The classic Three Card Monte with giant cards (42.5 x 28 cm) made of hard paper. The trick can be performed on the biggest stages as well because the cards can be perfectly well seen from the back row, too. The magician shows the audience two kings of clubs and one queen of hearts. He turns them face to himself and shuffles them. When he asks the spectators which the queen is, they will not be able to guess correctly. The magician performs the trick several times but all in vain: the spectators have bad luck. When he shuffles the three cards face to himself, he tries to make it somewhat easier and asks the spectators which the king of clubs is. The spectators are again wrong. 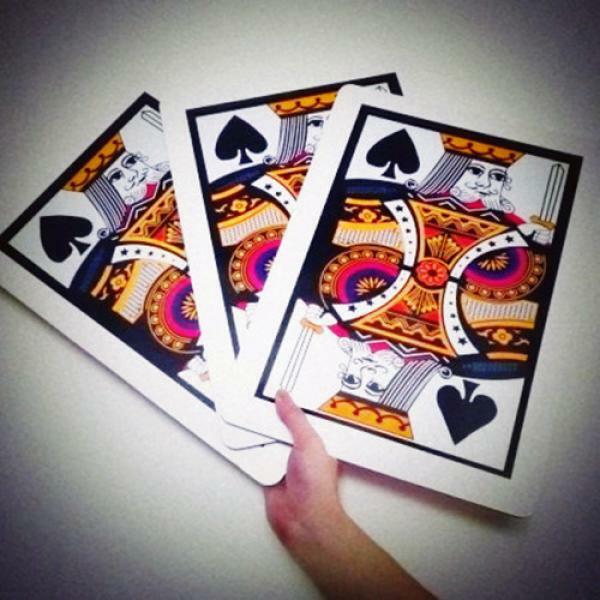 The magician says he is very sorry but the spectators did not guess correctly again: this time he has got three queens of hearts in the hand.